The home for sick and dying children was a huge experience for me. I did not want to go. Hospitals have always been a place I do not like to go. Yet, I went. It was the plan for the team. I saw dozens of children in row after row of cribs. Many suffered from malnutrition. Some had Iv bags hanging. It was hard to see all of these children suffering. Yet, it was immediately evident that they all were being nursed back to health. While it did not have the standards we see in America, it was a place that had the same goal. To save a life. I was holding a baby. After ten minutes, the nurse pointed to the door. A man was standing there. Speaking in hand singles, she directed me to hand over the child. I later learned he was the girls father. I watched as he carried his child off. He sat down in the courtyard, hugging, smiling, and loving on his child. All could think, was that could have been me. That could have my child! I cannot imagine a stranger, caring for my baby and being limited to an hour of visitation. Yes, I hate hospitals. This one was different. For me it was Gods love factory. Everywhere I looked, I saw God working. Our next stop was Dare’s. A home for disabled children. This is my second trip, and I looked forward to being here again. I love that place. God is present. Its funny, I think that I am going there to give. I made the effort to get here. I came with the intent of helping, of giving. Yet at Daria’s, I am the one who receives a gift. 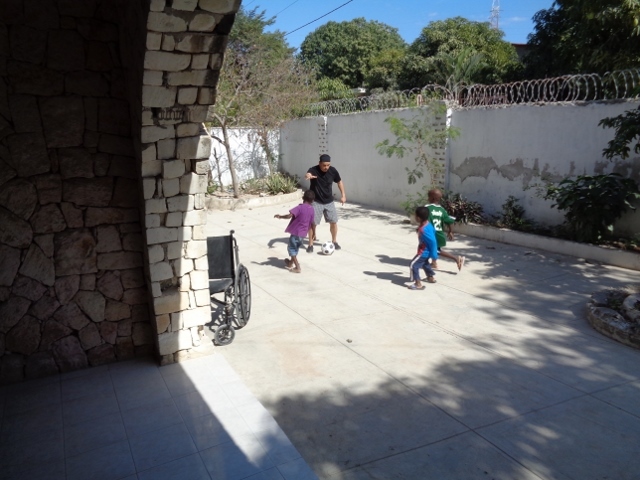 I played soccer with the kids, shared in music and stories. And I received the gift. One young boy pointed through the window to the great room in the home. Then he ran around the corner and was soon in the room, just as Aaron was starting to play the guitar. I motioned for Aaron to come outside. As soon as he made it back out front and sat down on the step the little boy grabbed the guitar from Aaron. 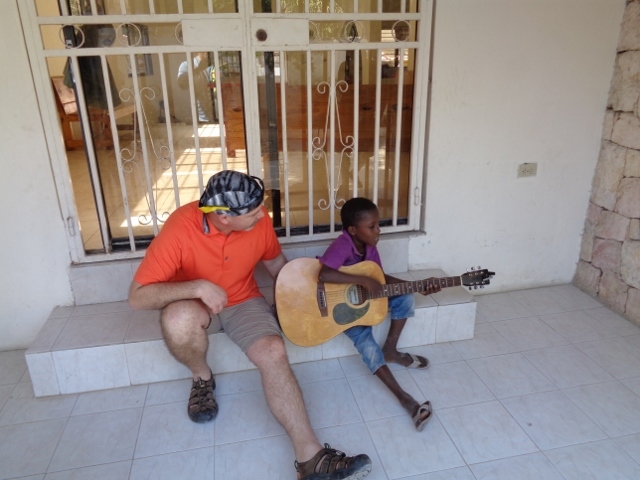 This young boy started strumming the guitar with a wonderful rhythm and began singing. He sang beautifully. He sang worship songs, lifting his voice t heaven. It was indescribable. The only thing I know is that God was smiling down. I know God felt the joy of that child. From my standpoint I saw a child, missing one eye, in a destitute environment; Worshiping with a joyful heart. This child, one you would think would have no reason to worship God, brought God to me. Our final stop of the day was at the Apparent Project and it’s retail sister business, Papillion. Started in 2011 with five employees, they are now over 200 employees strong. The place is a model for job creation and economic development. They are educating their employees. They provide daycare to children ages zero to three. Next year they will add a kindergarten program to keep the kids in school for two more years while their parents (many who are single mothers) work. It was refreshing seeing the children here. It was a stark contrast to the children we spent time with earlier in the day. There we saw hope.